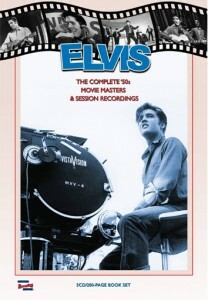 This Memphis Recording Service release is a Limited Edition 5CD/200-page book containing the complete works of the master and | Session studio recordings made for each of Elvis’s movies during the 1950s, and all tracks have been remastered with many restoration surprises ignored by other labels. The 200-page book focuses on each of the recording | Sessions held for the four motion pictures made between August 1956 and March 1958. The comprehensive text is complemented by rare and previously unseen photographs and documentation. This Limited Edition 5CD/Book set pays tribute to Elvis Presley’s complete music recordings made for his movies during the 1950s. This entry was posted on Friday, April 6th, 2018 at 1:43 pm	and is filed under Essential Elvis News, General Elvis News. You can follow any responses to this entry through the RSS 2.0 feed.